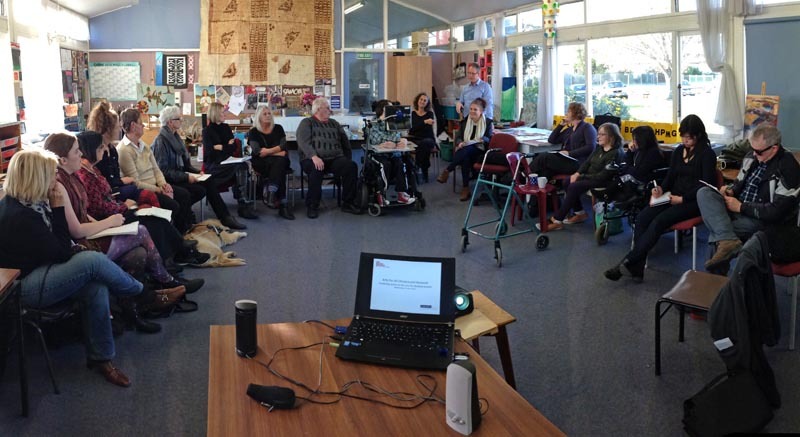 I'm jotting down some reflections (aka ramblings) that came from my participation at the Arts for All Christchurch Network meeting on 15 June 2016, hosted by Claire and Richard. I have always looked forward to the network meeting in Christchurch, hosted by Arts Access Aotearoa, and being among hope and dialogue, not of the rhetoric, but at what is being done, what is going to be done, what is happening, and how people are going to make it happen: to make arts accessible to people, to everyone, in Christchurch, and beyond. The first reflection is that, as much as I have basked in the hope and dialogue of "access" at the meeting from arts venue providers, coordinators and exhibitors, there is still a dialogue I would hope to hear at future meetings. I use "hearing" here not in the sense of auditory transmission, but in the feeling and the passion, that "access" is not a noun, nor a tick in the box. It is not a system, it is not a device. It is not "access" for or to disabled people, but it is with disabled people. I hope to hear the voices of the people accessing this "access". I really hope to hear a dialogue of "access" as a verb rather than a noun. I also hope to hear the intersectionality of inclusion of voices from marginalised groups, rather than the "silo-ing" of providing "access" to who. The second reflection that I would like to share is when we broke into our respective small groups and I joined the session to discuss about policy, I said something then which I was surprised myself when it came out of my mouth. I asked: What is the point of presentation (as every artform is a presentation of expression) if it is not for people to be able to "access" it? Thus my second hope for "access" at future meetings is to hear what is fashionably called a paradigm shift, in that rather than thinking about who we include, why not think about how we can break down the ongoing barrier of access? Original generation time 2.3919 seconds. Cache Loaded in: 0.0005 seconds.